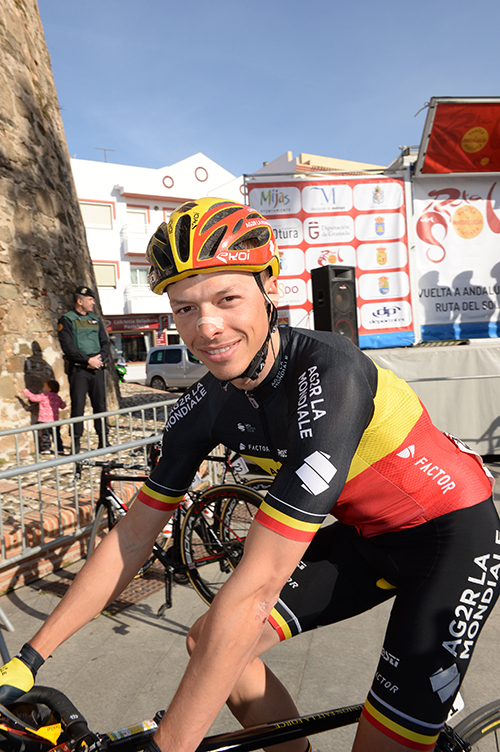 Having crashed during the Dwars door Vlaanderen, Oliver Naesen suffered from pain in his the left knee. Further tests on Thursday at the Ghent Hospital did not show any bone contusion. Oliver was told to rest Thursday, and a final decision will be made on Friday after pre-riding the route for the Tour of Flanders. “If his recovery progresses in the right direction, all should be operational and in good condition,” explained Dr. Grégory Ornon, doctor for the AG2R LA MONDIALE team. Four riders from the team have taken part in all the Flandrian classics on the UCI WorldTour calendar (Omloop Het Nieuwsblad – Record Bank E3 Harelbeke – Gent Wevelgem – Dwars door Vlaanderen), in addition to Oliver Naesen, the other riders are Stijn Vandenbergh, Nico Denz and Gediminas Bagdonas. 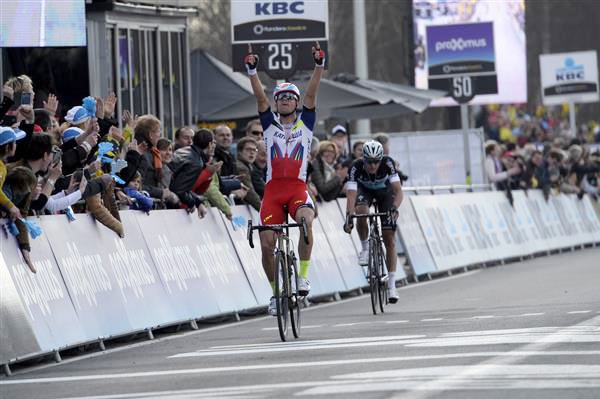 The team will be completely built around the European champion, Alexander Kristoff, for the Tour of Flanders on Sunday. The only Norwegian to win the Belgian monument in Flanders, taking the trophy in 2015 when he topped Niki Terpstra in a two-up sprint. “I won’t be the favourite for Flanders, but the recent classics here in the north pushed my level higher, so I hope to be one of the protagonists,” said Alexander Kristoff. Roster: Alexander Kristoff (Nor), Filippo Ganna (Ita), Ben Swift (GB), Sven Erik Bystrøm (Nor), Marco Marcato (Ita), Oliviero Troia (Ita), Simone Consonni (Ita). Sports Directors: Mario Scirea (Ita), Philippe Mauduit (Fra). BRI Note: Alejandro Valverde will be riding the GP Miguel Indurain, not the Tour of Flanders on Sunday. The Club Ciclista Estella has made a very distinct change to the route of the 20th edition -under its current name- of the GP Miguel Indurain. The hilltop finish at the Santuario de Nuestra Señora del Puy, which somewhat conditioned how the race unfolded despite the tough Alto de Eraul being tackled before, is now gone and replaced for the traditional, flat finish at the Inmaculada boulevard, in the heart of the city. The 186km race, the only UCI event entirely hold on roads of Navarra, are divided into a softer first 90km and a very demanding second half, with up to ten climbs. There will be three ascents of the Alto de Ibarra -the last one completed just 2km from the end-, a longer side of the Puy climb already used in previous years. Two times will the Alto de Muru be tackled, just before the final climbs of Ibarra. Also on the route are the gentle uphill to Irache, right after the last passage through the finish, and the more demanding Alto de Arradia. And to make things even harder, three longer ascents: Guirguillano (Cat-1; 120km); Lezaun (Cat-2; 139km) and, above them, Eraul (Cat-2; 3.7km at 6%), crested just 11km from the finish with Muru and Ibarra still left before the line. HEERENVEEN, The Netherlands – Today Accell Group NV announces that it has taken over 100% of Beeline Bikes shares. Beeline is a mobile bike shop franchisee operator that delivers a turn-key sales, service and data collection solution tailored for IBD’s in North America. Accell already owned a minority shareholding in the company. Accell regards Beeline Bikes a perfect fit to its strategy to offer mobile bike services as part of the company’s consumer centric omni-channel model. Because of that Accell wants to take Beeline to Europe.